1986 was a great year, the Mets won the World Series, mountain biking was gaining steam, and BMX was on the mind of every kid in every neighborhood. It was also the year Rad premiered in the theatres. It plays at the Abbey Theatre this thursday night at 9pm. Thats all I know. I’m there! It was sweet. Try to watch this amazing film the next chance you get. 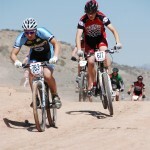 The sweet, sweet Alien Run mountain bike race returns this sunday. 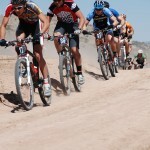 Aztec, New Mexico’s Alien Run Trail will be the track for this weekends shred fest. To register, show up at HWY 173 mile marker 2, a left turn coming from Durango before downtown Aztec, in the 8-9ish hour. The fee is $30 and it is so worth it. This is a great race for beginners and professionals alike. The Beginner race course does not do the Alien Run trail. See you all there. DEVO! News my friends. Iron Horse Bicycle Classic weekend is a month away. Kids racing will be sunday morning downtown on the crit course. It sounds like the TommyD junior race will be there as well this year, taking place in the morning before the usual kids race. Get ready JrDEVO’s! A week or so after on June 9th, Ivan Unkouskoy will be leading the yearly Shalona Hill trash cleanup at 530. Bring your own gloves and meet near Timberline Academy. Durango Wheel Club has been cleaning up after lame trash throwing cyclists for years. Do Not Ever Throw Your Gel Packets! This sunday there will be a Mercy/DWC Crit Race at Mercy Medical Center. I believe it starts at 9am and the last group races at 11am. Check Durango Wheel Club for better informaton. October 11th at Three Springs will be a running and a mountain bike race, both taking a back door approach to Horse Gulch. The event is to be called Tour of Durango. 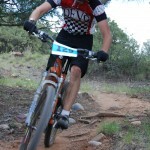 On sunday October 12th will be te actual “tour,” which will take cyclist all over Durango’s tasty trails. The ride will start and finish at Carver’s. Local bike polo film Mallethead has been added to the list of films at the Telluride Mountain Film Festival. The event organizer has assembled a team of locals to take on the Durango crew during the festival. The film fest takes place over memorial day weekend and also features Fruita photo honch, Anne Kellers’ photographic work with recently paralyzed, former world ranked slalom star, Tara Llanes. In related news, Mallethead has not been accepted into the world traveling Bicycle Film Festival. We are very sad to hear this news, but sometimes you need to get shot down. We are currently working on the complete DVD package and will be available to the public this summer. Polo; Sunday’s at Park Pologrounds, 2hrs before sundown. Thanks to Seth Lander for buying the 1986 VW Van that Mary Monroe and Travis Brown of Trails 2000 donated to us last winter. The money will go towards a team vehicle in the future. Nice work team! 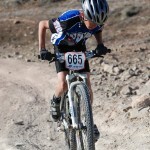 In related news, Travis placed 1st in the singlespeed xc and 5th in the Sea Otter super D event. Travis is the man…..and Mary is the man too! 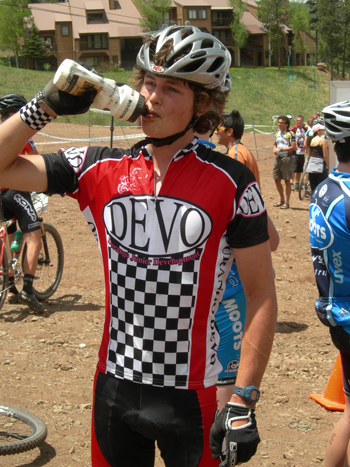 DEVO friend Todd Wells paced 11th today in Houffalize, Belgium, at the World Cup season opener. Todd is on a mission to compete in the upcoming summer Olympics in Bejing. Julien Absalan, last Olympic gold medalist, took the victory. Three weeks under the belt so far. It is amazing how fast they learn and progress. We think it also helps the learning when they are amongst their peers. The big groups are tough at times, but for the most part, they offer more models to the skill of cycling. We all get better when we ride with our friends. The mud hasn’t been too bad so far, and sorry if it has. Kids like riding straight through as it actually is the proper trail edict when spring riding. Parents, ask your kids how to brake, climb, mount a bike or descend and see what they have to say. Let them teach you a skill if the timing is right. Oh yeah, Bike/garage moving sale at Anne and I’s house this saturday 10-5, tons and tons of bikes and parts. Check it out. Check out the USA’s model High School racing league. These guys are so organized and make cycling dreams come true for hundreds of Northern California youth. Rock Onward! 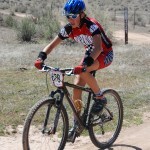 Colorado has just begun getting something similar called CMBL, Colorado Mountain Bike League. DEVO head coach Chad Cheeney is one of the board members for the upstart HS/MS league, so contact him at chad@durangodevo.com if you have any ideas. What a great weekend of racing. Here are some photos Jeanne Pastore shot while DEVO was on course. Jeanne has been photographing the team throughout the years and her work is used frequently on this blog site. Top pro BMX rider Kenth Fallon will be conducting a 3 hour clinic from 9 am to 12 pm this Sunday (April 20th) at Durango BMX. The picture is not Kenth, but local super star Grady James, why…I do not know. The cost is $30. Riders of all ages and ability levels (including beginners) are welcome. Kenth has been to our track multiple times in the past and is a great teacher. Our first race of the season will follow the clinic. If you would like more information, contact Field Blevins (970-759-5700). Everything must go! This Saturday the 19th of April marks the Cheeney’s big garage/bike shop sale. The landlord wants his casa back, so Anne and Chad must unweight and move out. Weighting was the result of 14 combined years of living in the Childress home at 1015 E 5th. The sale is worth stopping by and seeing the cycling history before your eyes. There is not that much good stuff, but the great stuff is pretty sweet. Please stop by and buy some stuff, you will not be disappointed. This is week three my friends. 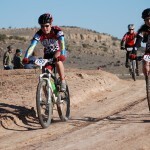 Our first team race has passed and our next is May 2-4 in Nathrop, CO. We will be camping as a team at a sweet campground. More on that soon. This friday the 18th is our first U-14,19 skill sesh at the factory trails. We will be working on our fundamentals so be prepared to relearn. Next friday the 25th will be our first monthly Telegraph Hill Climb Time Trial. Get ready to feel that feeling. April 27 is the local race Alien Run in Aztec, NM. It is always a fun scene and I recommend we all give it a go. Start saving your old bike parts to sell at the Velo Swap on May 23rd. It will be DEVO’s spring time fundraiser. Thats about all we got for now. Have a nice spring day. Hey. We all have wind burnt lips and red noses, but the real news lies within the realm of team results. 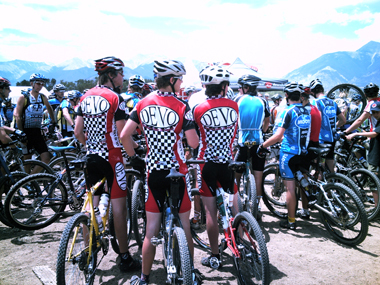 Durango DEVO riders placed well this weekend in Saturdays individual time trial and Sundays cross country. Here are the results; Alicia Rose Pastore 1st jrExpert TT and 1st jrX XC, Kaila Hart 1st JrSport XC, Joan Walker 3rd JrSport XC and Super Coach Kricket on full factory support. More; Stephan Davoust 1st JrBegginner XC, Chris Blevins 2nd JrBeg TT and 2nd JrBeg XC, Gino Pastore 1st jrSport TT and 2nd jrSport XC, Sepp Kuss 3rd JrSport TT and 3rd JrSport XC, Chase Orrick 8th JrExpert XC and Howard Grotts 4th JrX TT and 10th JrX XC. More; Alumni Tad Elliott 8th Pro TT and 7th ProXC, Alumni Joe Schneider 24th semiproXC, Coach Chad 24th Pro/Semipro TT and 29th XC and DEVO Director Annie Cheeney 6th SportXC. 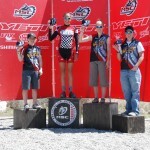 Camp Friend Robin Guillaume 3rd Singlespeed TT and 2nd XC, and Jr DEVO Volunteer Dylan Stucki 5th ProTT and 10th ProXC. It was a well played weekend for all in attendance. 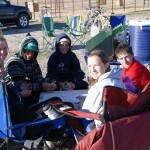 We camped together and worked together and smiles made themselves present. Fruita has amazing trails as both courses left us all chatting up race commentary, long after the timing chip ripped from our ankles. Thank you parents of DEVO for all of your amazing support. Our program would not be what it is without you and your children. You made good ones! 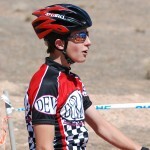 Fellow mountain bike mecca Fruita, Colorado will be the first stop of the season for the DEVO cyclists. A first year event, the Rabbit Valley Rampage consists of a individual time trail on saturday morning and a cross country on sunday. Attending the race will be; coaches Anne and Chad Cheeney, Kricket Lewis and riders, Alicia and Gino Pastore, Sepp Kuss, Howard Grotts, Taylor Borucki, Chase Orrick, Kayla Hart, Joan Walker, Chris Blevins an Stephan Davoust. Wish us luck and have fun roosting in DTown while we are gone.